No sooner had the Lung Association's annual "State of the Air" report been released on Wednesday than DFW promptly lived down to its reputation for bad air with its first Ozone Action Days and "exceedences" of the national smog standard of 75 parts per billion on Thursday and Friday. Thursday saw 8-hour averages of 79 ppb at the North Dallas monitor and 82 ppb at the Rockwall site. For three hours in the late afternoon that day the ozone levels in Rockwall were exceeding the old 1997 smog standard of 85 ppb and went as high as 97 ppb. In North Dallas, smog was also at 85 ppb or above for three hours and got as high as 90 ppb. Friday' problems were more widespread but not as intense. Five different monitoring sites exceeded the current 75 ppb standard, and the pattern of exceedences were more traditional. That is, the highest-reading monitors on Friday were the ones that traditionally produce the highest numbers every year. Keller and Grapevine averaged 76 ppb, Denton and Eagle Mountain Lake average 77 ppb, and Parker County averaged 79, seeing a peak of 82 in early afternoon. In all, as of Friday evening, seven out of the 20 DFW smog monitors had their first official excedence of the current 75 ppb standard. As veteran observers know, it takes four such exceedences to qualify as an official violation of the standard. That is, each monitoring site is allowed to exceed the standard three separate days before the fourth-highest day is counted as a violation. This methodology ends up masking the severity of a region's smog problem, but it's been used for over two decades now and so is the EPA's measuring stick of choice. Since it's only May, there's lots of time for one or more sites to accumulate four or more days over 75 ppb. What will be interesting to see this year is how many, if any, end up with 4th highest readings above the 1997 85 ppb standard – a level of compliance we had not been able to meet until last year's cooler and wetter summer. 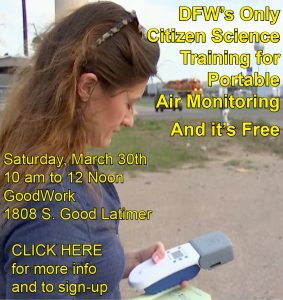 For tracking the four highest ozone levels recorded at all 20 DFW ozone monitors. Hovering over all these numbers is one more – the prospect of a new national smog standard by the end of the year. This is the one that was at the center of the EPA's national hearing in Arlington this last January. Although EPA's own panel of scientists has recommended a level of 60-65 ppb, most pundits believe it will end up between 65 and 70 ppb. So when you see officials boasting about lower ozone levels in DFW, keep in mind that the medical consensus is that the current 75 ppb standard set by the Bush administration is still too high to protect public health. 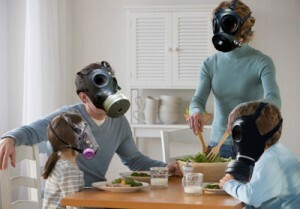 Previous post: What’s worse than DFW air being bad? The news coverage of it being bad.